I’ve got a full-page opinion piece in this week’s New Scientist, on why mathematicians should refuse to cooperate with agencies of mass surveillance. If you’re in the US, UK or Australia, it’s the print edition that came out yesterday. The substance is much the same as my piece for the London Mathematical Society Newsletter, but it’s longer, and it’s adapted for a US readership too. I don’t currently have much to add to the article or what I wrote about mathematicians and the secret services previously. But I do have some observations to make about the process of writing for New Scientist. This was my first time writing for a magazine. The article received substantial edits from at least three editors; you can compare it with the version I originally submitted. I have mixed feelings about this process. On the one hand, it’s great to have the input of experienced magazine journalists, and I can definitely see ways that they improved what I wrote. On the other hand — and despite the editors I dealt with being reasonable, helpful, and pleasant — I found the process pretty frustrating. I think that’s because of where the control lies. What doesn’t happen is that you submit your piece, the editors read it and give you their critiques, and then you amend your article accordingly. What does happen is that you submit something, the editors change it how they like, and if you don’t like any of their changes, you have to argue for why it should be changed back. This process may be iterated several times, perhaps with different editors with different opinions. Rationally, I know that the article goes out not only under my name but also under the magazine’s, but by the end of the process, I did have the depressing feeling that the article wasn’t entirely mine. Anyway, it was a new experience. Comments are open. As ever, if you’re leaving comments on the political aspects, please keep them focused on the relationship between mathematicians and the secret services. Mathematiker-Aufruf: Arbeitet nicht für die Geheimdienste!, Spiegel Online, 28 April 2014.
your begins with ” … These organisations stand accused of law-breaking on an industrial scale and are now the object of widespread outrage”. Ordinary honest folk like a bit of privacy but are mostly interested in security. In many circumstances security and privacy are opposites. For example the people who really care about privacy are criminals, and people pushing the limits of what’s legal who don’t want too much scrutiny (like maybe the entire finance industry). What we need to do is convince people that the greatest threat to their security is their own governments drifting in a 1984/North Korea direction. We need to counter that with much more accountability and sousveillance (see David Brin). Did you mean to say that? I didn’t mean to suggest that there aren’t other people genuinely interested in privacy, such as those struggling against unjust government/officaldom. My reply was just in response to the question “why are we so complacent”. I agree with David Brin that privacy isn’t coming back (till we start living off this planet) and we need more transparency. His book “The Transparent Society” was quite prescient. The New Scientist article is currently featured on the front page of Slashdot. Welcome, Slashdot visitors! Ah, but /. didn’t link here, just to the New Scientist piece. Wow. Thanks for telling me; no one else did! Tom’s New Scientist article was picked up by the French online newspaper Mediapart. Thanks very much for letting me know. Tom Leinster, of the University of Edinburgh, calls on his colleagues worldwide to boycott the NSA and refuse to work with the agency while it continues its global spying programme [note 2]. In an opinion piece published on the website of New Scientist, Tom Leinster, a mathematician at the University of Edinburgh, calls on his colleagues worldwide to boycott the NSA and refuse to work with the agency while it continues its global spying programme. Tom Leinster notes that the American agency is “the largest employer of mathematicians in the US”, maybe the world. Mathematicians are essential to the development of the different surveillance programmes developed by the NSA, notably those concerning cryptography. I want to clarify two things about that summary. I don’t actually call for mathematicians not to work for the NSA (at least, not in this article). I list various dubious things that the NSA and GCHQ are doing, I say something about the role played by mathematicians, and I emphasize that we have the power to choose not to cooperate, if we so wish. But that’s as far as I go in this article. It’s actually rather cautious and conservative. The Mediapart summary uses the phrase “espionnage mondial”, which I assume translates as global/worldwide spying. I think that’s a slightly risky way of putting it. Pretty much everyone, including me, agrees that spying on targeted individuals is acceptable under certain circumstances. In that sense, it’s unobjectionable that the US has a global spying programme. The problem is the nature of its global spying programme — that it aspires to collect all communications of all people, not just those of a few justified targets at specific times. If you would like to see a translation, just let me know. Would it be a violation of copyright to post a translation here? There’s now also a Spiegel article and an article in Boing Boing. I suppose I should have seen this coming, but most of these articles exaggerate my views in one way or another. E.g. Boing Boing headline it with “Mathematicians: refuse to work for the NSA!”, which is exciting but not what I say. Similarly, some commenters on some of the articles object to the “fact” that I ask national mathematical societies to expel members who work for the NSA/GCHQ. Only, I don’t say that. I simply observe that the societies could do that (if they wanted), just as they can (if they want) cooperate unquestioningly with the secret services. The choices are ours to make. So here’s my (probably mediocre) translation of the Zeit piece, including the original links. By the way, the readers’ comments below the article are mostly positive, although many also question the impact that this is going to have. The NSA is the biggest employer for mathematicians in the United States. A Brit now wants to persuade his scientific colleagues to stop working for secret services. What can be done in order to make surveillance of the world more difficult? Encrypt everything, say the techies. Pass new laws and treaties, say politicians. Cut off the NSA’s water supply, says Marc Roberts. Without water, the NSA will not be able to run its gigantic new data processing center near Bluffdale in Utah. The secret service needs up to 1.7 million gallons a day. Marc Roberts, a member of parliament in Utah’s House of Representatives, has picked up on a proposal of activists and introduced a draft law that would prohibit anyone to provide material supplies to the NSA — including water. However, it is unlikely that his draft will turn into law. The mathematician Tom Leinster has a different proposal for how to draw off an important resource from the NSA: its employees. Besides money, technology, electricity and water, the secret service also needs suitable personnel. By their own account, the NSA is the biggest employer for mathematicians in the United States. Leinster, mathematician at the University of Edinburgh in Scotland, now calls upon his colleagues in the New Scientist magazine to not work for the NSA or the British secret service GCHQ. Universities could forbid their employees to work there. The mathematical societies could cease to publish job advertisements by the secret services, reject their funding, or even evict those among their members that work for the NSA or GCHQ. 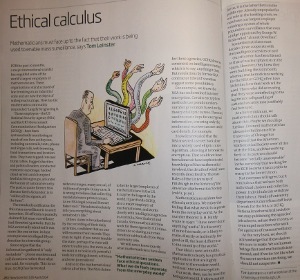 “Mathematicians are rarely confronted with ethical questions”, Leinster writes. “We enjoy the feeling that everything that we do is decoupled from the real world.” But [according to Leinster], the NSA revelations showed that secret services have undermined Internet encryption. And for this, they needed mathematicians.